The Minnesota State Arts Board is a state agency that stimulates and encourages the creation, performance, and appreciation of the arts in the state. The Artist Initiative grant program is designed to support and assist professional Minnesota artists at various stages in their careers by encouraging artistic development, nurturing artistic creativity, and recognizing the contributions of individual artists to the creative environment of the state of Minnesota. The Folk and Traditional Arts grant program is designed to enrich Minnesota communities through folk and traditional art forms being passed on, documented, practiced and shared. Folk and traditional arts refer to artistic traditions that come from and are rooted in the cultural life of a community. Community members may share a common ethnicity, geographic or regional identity, occupation, language, or tribal affiliation. The Folk and Traditional Artst grant application deadline is Friday, May 17, 2019: learn more and apply today. 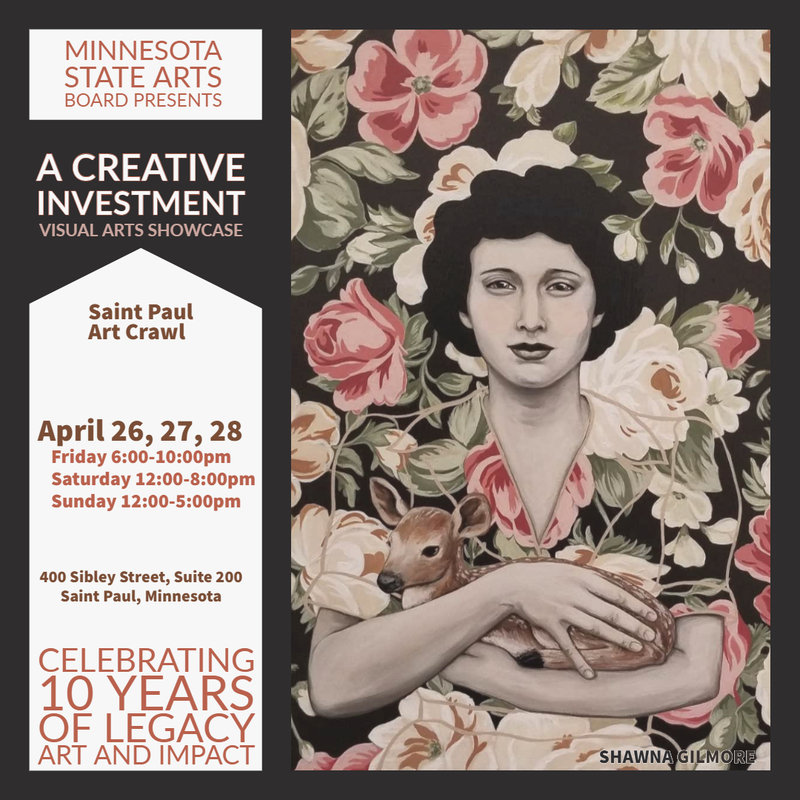 The Minnesota State Arts Board presents A Creative Investment, a visual arts showcase, celebrating ten years of Legacy art and impact. The exhibit features work by all ages – kindergartners to older adults – and all abilities, made possible by funding provided through the Legacy Amendment. Its theme is that all Minnesotans are creative, and all benefit from the arts. Friday, April 26, 6:00 p.m. -10:00 p.m., Opening reception at 7:00 p.m.
Saturday, April 27, 12:00 p.m. - 8:00 p.m.
Sunday, April 28, 12:00 p.m. - 5:00 p.m.
Have you ever wondered how the Arts Board decides which applications to fund? Have you ever wanted to make those decisions? Then you might be interested in serving as a volunteer advisor to the board. The Arts Board uses a very rigorous, citizen-driven process to review grant applications, and to select artists to commission or work to purchase for the state’s permanent art collection. Each year, approximately 250 individuals serve as volunteer advisors in the board’s ten grant programs and in the Minnesota Percent for Art in Public Places program. Advisors read proposals, discuss them in a public meeting, and assign scores for each proposal. The scores help determine which proposals will be recommended to the board for approval. The amount of time and tasks required vary, depending on the program in which the volunteer serves. Advisors must have experience or expertise in a particular area of the arts, arts funding, or nonprofit or public administration. If you’d like to nominate yourself or someone you know to serve as an advisor, please complete and submit our volunteer form. The Minnesota State Arts Board's WebGrants system is open for registration! Please view the How to Register in WebGrants tutorial, and then click Login to WebGrants to sign up. If you'd like to receive information and updates from the Arts Board via e-mail, please sign-up for the board's electronic mailing list.